These should be good days for Japan's Prime Minister Abe. 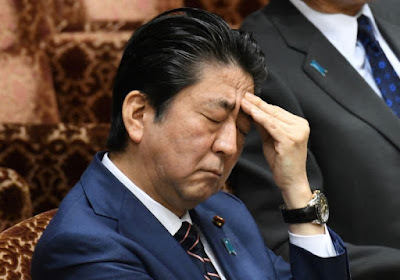 After being punished in local elections, Abe recovered to push back a challenge by his former defense minister and now governor of Tokyo. He reappointed Kuroda at the helm of the Bank of Japan, breaking from a 50-year tradition of one-term BOJ head. The Japanese economy is enjoying its longest expansion in a couple of decades. The threat of deflation has been arrested, and in February Japan's core inflation stood at 1.0%, the same as the ECB's core measure, though it is calculated quite differently. The US pulled out of the Trans-Pacific Partnership talks. Abe had belatedly seen how TPP could further his own domestic agenda. Although many thought this ended the Obama Administration's "pivot to Asia," Trump's stepped-up efforts to confront North Korea and China offers much for Abe to like. Still, there has been divergence. The US did not step-up its confrontation until North Korea claimed the ability to strike the US homeland, even though treaties obligate the US to regard on attack on Japan as the same as an attack on it. Japanese officials are concerned that in bilateral talks the US may sacrifice Japan's interest to secure a deal. Several countries have been given exemptions, some permanent and some temporary, from US steel and aluminum tariffs. Not Japanese producers. It may be more of a political insult than an economic injury for Japan. While Macron and Merkel, who will visit the US later this week, will seek an exemption for EU members, Japan may pursue a different set of tactics, allowing Abe to focus on security issues when he calls on Trump next week. The US is the destination of less than 10% of Japan's steel exports. Asia is home to 805 of Japan's 38 mln tons of steel exports. Rather than push for a country exemption, Japan may be counting on product exemptions. Simply put, more than a third of Japan's steel exports to the US are specialty products that have no or few domestic alternatives. Without Japan's steel products, high-grade piping in deep underground oil well would be disrupted, as would some auto production and rail track. Note too that some Japanese steel producers have long-term contracts with customers, some of which, for example, may be Japanese auto and part makers. Some of Abe's challenges are home grown. There is a scandal over the government sale of land to a nationalist school at a deeply discounted price. The person who operates the school is a personal acquaintance of the Prime Minister and his wife. MOF documents about the sale were changed to remove their names. A MOF official testified before parliament earlier today that an employee had asked the buyers to lie about the reasons for the heavily discounted price. Another scandal is breaking. The issue is over the log from the 2003 deployment of Japanese troops in Iraq (in support of the US-led campaign). The log apparently missing, was later found, but failed to inform the defense minister. The Air Self-Defense Forces also failed to that its logs had been found. The defense minister had testified before parliament that such logs did not exist a month after they were found. This is strikingly like an incident last year. The log of the ground self-defense forces engaged in a UN peacekeeping mission in South Sudan led the resignation of the defense minister (Inada) last July. The problem stems from Japan's constitution that prevents the use of Japanese troops in combat areas. While the government defined the deployments as non-combat missions, a closer look at the areas of their activities may contradict such claims. It is well known that Abe wants to jettison the pacifist parts of the constitution, and has already promoted a more liberal interpretation. Over the past weekend, Japan activated a 2100-person amphibious brigade for the first time since WWII. The unit includes helicopter carriers and amphibious ships and assault vehicles. It is aimed at countering the invasion and occupation of islands that are claimed by China too. Adding insult to injury, the fruits of the aggressive monetary policy have begun fading. The Nikki rallied 19% last year, culminating a 188% rise since the end of 2011 and the start of Abe's second time as Prime Minister. The gains are being pared. After rising almost 1.5% in January to reach its best level since 1991, the Nikkei fell in both February and March (~7.2%). It is a little more than 1% high so far here in April. Small caps are doing only slightly better than the large caps this year, though the JASDAQ and the Topix REIT Index are posting small gains for the year. The dollar fell through JPY105, the last major support ahead of the psychologically significant JPY100 level in late March, ostensibly as Japanese accounts stepped up their hedging in front of the fiscal year. There are a few technical indicators suggesting that the dollar's leg down that began in early January near JPY113 has run its course. A move above JPY108 would target JPY110. The dollar-yen is often a range-bound currency pair, and the new range may be JPY105-JPY110.